The present invention relates to modified thermoplastic resin compositions, and, more particularly, to weatherable and impact modified compositions containing a blend of a polyester resin and a polycarbonate resin. Impact-modified thermoplastic resin blends that include a polyester resin, a polycarbonate resin and a glycidyl ester impact modifier are known, see, e.g., U.S. Patent Nos. 5,112,913 and 5,369,154, and have been used to mold articles, e.g., automotive components such as mirror housings and cowl vent grilles, wherein a glossy, defect-free surface appearance is of extreme importance. A polymer blend comprising a polyalkylene terephthalate, an organopolysiloxane-polycarbonate block copolymer, and a halogenated copolycarbonate having improved impact, heat distortion and flame retardant properties is described in U.S. Patent 4,155,898 to Bopp. U.S. patent 4,794,141 to Winfried et al. relates to molding compositions containing polydiorganosiloxane/polycarbonate block copolymers, elastomeric polymers and, if appropriate, polyalkylene terephththalates. The elastomeric polymer is described as a hvdrogenated block copolymer of a vinyl aromatic monomer and a conjugated diene. U.S. patent 4,994,532 to Hawkins et al. describes functionalized polydimethylsiloxane fluids which react with polycarbonate in the melt to form polydimethylsiloxane/polycarbonate block copolymers. The resultant copolymers are described as transparent and show improved flow. U.S. patent 5,026,791 to Hawkins et al. relates to an aromatic carbonate polymer having a siloxane unit in the backbone of the polymer. U.S. patent 4,161,498 and 4,155,898, both to Bopp, and U.S. patent 4,161,469 to LeGrand et al. describe polyalkylene terephthalate resin and an organopolysiloxane-poly-carbonate block copolymer having impact and heat distortion properties. While articles molded from known impact-modified polyester resin/ polycarbonate resin blends provide, e.g., good impact performance, the weatherability of such articles has been found to be deficient in some applications, i.e., it is desired to retain the impact resistance after long term exposure UV radiation, especially low temperature impact resistance. Hence, it is desirable to provide a molding composition having a combination of flame resistance, impact resistance with enhanced weatherability. It is an object of the present invention to provide flame retarded weatherable thermoplastic blends having low temperature impact and low temperature impact retention under long-term UV exposure. Another object of the present invention is to provide flame retarded polyester resin molded articles and molding compositions which are suitable for molded housings for devices which are used in exterior applications. According to the present invention, there are provided flame retarded resin molding compositions with enhanced weatherable properties, which comprise a polyester and polycarbonate blend modified with an organopolysiloxane-polycarbonate and a glycidyl ester impact modifier for enhancing weatherability and a flame retarding amount of a halogenated flame retardant. Additional ingredients may include a mineral filler, and other ingredients such as quenchers, flame retardant synergist, and antidrip additives. wherein each A is independently a divalent aliphatic, alicyclic or aromatic hydrocarbon or polyoxyalkylene radical, or mixtures thereof and each B is independently a divalent aliphatic, alicyclic or aromatic radical, or mixtures thereof. Examples of suitable polyesters containing the structure of the above formula are poly(alkylene dicarboxylates), liquid crystalline polyesters, and polyester copolymers. It is also possible to use a branched polyester in which a branching agent, for example, a glycol having three or more hydroxyl groups or a trifunctional or multifunctional carboxylic acid has been incorporated. Furthermore, it is sometimes desirable to have various concentrations of acid and hydroxyl end groups on the polyester, depending on the ultimate end-use of the composition. The A radical may be, for example, a C2-10 alkylene radical, a C6-C12 alicyclic radical, a C6-20 aromatic radical or a polyoxyalkylene radical in which the alkylene groups contain about 2-6 and most often 2 or 4 carbon atoms. The B radical in the above formula is most often p- or m-phenylene, a cycloaliphatic or a mixture thereof. This class of polyester includes the poly(alkylene terephthalates). Such polyesters are known in the art as illustrated by the following patents. Examples of aromatic dicarboxylic acids represented by the dicarboxylated residue B are isophthalic or terephthalic acid, 1,2-di(p-carboxyphenyl)ethane, 4,4'-dicarboxydiphenyl ether, 4,4' bisbenzoic acid and mixtures thereof. Acids containing fused rings can also be present, such as in 1,4- 1,5- or 2,6- naphthalenedicarboxylic acids. The preferred dicarboxylic acids are terephthalic acid, isophthalic acid, naphthalene dicarboxylic acid, cyclohexane dicarboxylic acid or mixtures thereof. The most preferred polyesters are poly(ethylene terephthalate) ("PET"), and poly(1,4-butylene terephthalate), ("PBT"), poly(ethylene naphthanoate) ("PEN"), poly(butylene naphthanoate), ("PBN") and (polypropylene terephthalate) ("PPT"), and mixtures thereof. Preferred blends of polyesters include blends that incorporate PBT and PET. wherein n is an integer of from 2 to 6. B is a C6-C20 aryl radical comprising a decarboxylated residue derived from an aromatic dicarboxylic acid. Also contemplated herein are the above polyesters with minor amounts, e.g., from about 0.5 to about 10 percent by weight, of units derived from aliphatic acid and/or aliphatic polyols to form copolyesters. The aliphatic polyols include glycols, such as poly(ethylene glycol). Such polyesters can be made following the teachings of, for example, U.S. Pat. Nos. 2,465,319 and 3,047,539. The preferred poly(1,4-butylene terephthalate) resin used in this invention is one obtained by polymerizing a glycol component at least 70 mol %, preferably at least 80 mol %, of which consists of tetramethylene glycol and an acid component at least 70 mol %, preferably at least 80 mol %, of which consists of terephthalic acid, or polyester-forming derivatives thereof. The polyesters used herein have an intrinsic viscosity of from about 0.4 to about 2.0 dl/g as measured in a 60:40 phenol/ tetrachloroethane mixture or similar solvent at 23°-30° C. VALOX Registered TM 315 polyester is particularly suitable for this invention having an intrinsic viscosity of 1.1 to 1.4 dl/g. Blends of polyesters may also be employed in the composition. As indicated earlier, preferred polyesters are poly(ethylene terephthalate) and poly(1,4-butylene terephthalate). When blends of these preferred components are employed the polyester resin component can comprise from about 1 to about 99 parts by weight poly(ethylene terephthalate) and from about 99 to about 1 part by weight poly(1,4-butylene terephthalate) based on 100 parts by weight of both components combined. Aromatic polycarbonate resins suitable for use in the present invention, methods of making polycarbonate resins and the use of polycarbonate resins in thermoplastic molding compounds are well known in the art, see, generally, U.S Patent Nos. 3,169,121, 4,487,896 and 5,411,999. Aromatic polycarbonate resins are, in general, prepared by reacting a dihydric phenol, e.g., 2, 2-bis-(4-hydroxyphenyl) propane ("bisphenol A"), 2,2-bis(3,5-dimethyl4-hydroxyphenyl)propane, bis(2-hydroxyphenyl) methane, 2,6-dihydroxy naphthalene, hydroquinone, 2,4'-dihydroxyphenyl sulfone and 4, 4'-dihydroxy-3, 3-dichlorophenyl ether, with a carbonate precursor, e.g., carbonyl bromide and carbonyl chloride, a halogen formate, a bishaloformate of a dihydric phenol or a carbonate ester, e.g., diphenyl carbonate, dichlorophenyl carbonate, dinaphthyl carbonate, phenyl tolyl carbonate and ditolyl carbonate. In a preferred embodiment, the aromatic polycarbonate resin comprises one or more resins selected from linear aromatic polycarbonate resins, branched aromatic polycarbonate resins and poly(ester-carbonate) resins. Suitable linear aromatic polycarbonates resins include, e.g., bisphenol A polycarbonate resin. Suitable branched aromatic polycarbonates are made, e.g., by reacting a polyfunctional aromatic compound, e.g., trimellitic anhydride, trimellitic acid, trimesic acid, trihydroxy phenyl ethane or trimellityl trichloride, with a dihydric phenol and a carbonate precursor to form a branching polymer. Suitable poly(ester-carbonate) copolymers are made, e.g., by reacting a difunctional carboxylic acid, terephthalic acid, isophthalic acid, 2,6-naphthalic acid, or mixtures of acids, or a derivative of a difunctional carboxylic acid, e.g., an acid chloride, with a dihydric phenol and a carbonate precursor. In a preferred embodiment, the polycarbonate resin has an intrinsic viscosity of about 0.3 to about 1.5 deciliters per gram in methylene chloride at 25°C. In a preferred embodiment, the polycarbonate resin is a linear polycarbonate resin that is derived from bisphenol A and phosgene. In an alternative preferred embodiment, the polycarbonate resin is a blend of two or more polycarbonate resins. Suitable aromatic polycarbonate resins are commercially available, e.g., LEXAN™ bisphenol A-type polycarbonate resins from General Electric Company. In the above formulae, R' is a member selected from the class of monovalent hydrocarbon radicals, halogenated monovalent hydrocarbon radicals and cyanoalkyl radicals; E is a member independently selected from the class of hydrogen, lower alkyl, alkoxy radicals, aryl, and alkylaryl, halogen radicals and mixtures thereof, preferably hydrogen or alkoxy and when alkoxy, preferably methoxy; R" is a divalent hydrocarbon radical, preferably an alkylene radical of from 1 to 6 carbon atoms with C3 being most preferred, and n is from about 10 to about 120, preferably from about 40 to about 60. D is a divalent hydrocarbon radical containing from 1-15 carbon atoms; -S-, -SO-, -S(O)2; -O-. Preferably D is a divalent hydrocarbon radial. In the case where D is -C(R)2-, R is a member selected from the class of hydrogen, cycloaliphatic, alkyl, monovalent hydrocarbon radicals, aryl or alkyaryl, preferably R is alkyl, preferably C1-C6 alkyl, and more preferably methyl. Preferred polysiloxane-polycarbonate block copolymers are set forth in copending application EP-A-0524731 comprise from about 1 to about 50 percent by weight of siloxane. Additional preferred embodiments are set forth in EP-A-0626416 to Hoover et al entitled Terpolymer Having Aromatic Polyester, Polysiloxane and Polycarbonate segments. where X is an integer equal to 1 to 1000, inclusive, preferably 2 to 100, n is a number average equal to 1 to 100, inclusive, preferably 5 to 40 40, a is a number average equal to 1.1 to 100, m is equal to 1, and Z is an integer equal to 1 to 1000, inclusive, preferably 5 to 12. E, R, and R' being as defined hereinafter. Included within the radicals represented by R are aryl radicals and halogenated aryl radicals such as phenyl, chlorophenyl, xylyl, tolyl, etc. ; aralkyl radicals such as phenylethyl, benzyl, etc. ; aliphatic, haloaliphatic and cycloaliphatic radicals such as alkyl, cycloalkyl, haloalkyl including methyl, ethyl propyl, chlorobutyl, cyclohexyl, etc. ; R can be all the same radical or any two or more of the aforementioned radicals, while R is preferably methyl, R' includes all radicals included by R above except hydrogen, where R' also can be all the same radical or any two or more of the aforementioned R radicals except hydrogen and R' is preferably methyl. R' also includes, in addition to all the radicals included by R, except hydrogen, cyanoalkyl radicals such as cyanoethyl, cyanobutyl, etc. radicals. Radicals that are included within the definition of E are hydrogen, methyl, ethyl, propyl, chloro, bromo, etc. and combinations thereof, and E is preferably hydrogen. The organopolysiloxane-polycarbonate block copolymers can be made by any technique known to those skilled in the art including the techniques described by Merritt, Merritt, Jr., et al., and Vaughn Jr. in the U.S. patents referenced in the description of the prior art hereinbefore. Illustratively presently preferred organopolysiloxane-polycarbonate block copolymers contain repeating units of above Formula, set out herein before wherein X, Y, Z, a, n and m are as defined hereafter: Resin Type "A"; X equals about 7; Y equals about 8 to 10; Z equals about 1; a equals about 2; n equals about 10; m equals about 1. Resin Type "B"; X equals about 10; Y equals about 8 to 10; Z equals about 1; a equals about 2;n equals about 20; m equals about 1. Resin Type "C"; X equals about 5; Y equals about 8 to 10; Z equals about 1; a equals about 2; n equals about 20; m equals about 1. Blends of polyalkylene terephthalate resins and organopolysiloxane-polycarbonate block copolymers comprise blends of the aforesaid resins and copolymers. In general, the presently preferred blend contains at least one percent of an organopolysiloxane-polycarbonate block copolymer. Even more preferably are compositions wherein the organopolysiloxane-polycarbonate block copolymer component is present in an amount of at least about 2-50 percent, and more preferably from about 5-30 percent by weight of the composition. Since the relative proportion of organopolysiloxane-polycarbonate block copolymer relative to the polyalkylene terephthalate resin effect the physical characteristics of the compositions--the heat distortion temperature as well as the impact properties--the preferred ranges set out above have been selected since optimum heat distortion and impact properties are generally obtained within the preferred proportions noted above. Suitable glycidyl ester impact modifiers are polymers that comprise repeating units derived from one or more glycidyl ester monomers. As used herein, the terminology "glycidyl ester monomer" means a glycidyl ester of an ethylenically unsaturated carboxylic acid such as, e.g., acrylic acid, methacrylic acid, itaconic acid, and includes, e.g., glycidyl acrylate, glycidyl methacrylate, glycidyl itaconate. The glycidyl ester impact modifier is preferably utilized in an amount from about 0.5 to about 10 percent of the total composition. In a preferred embodiment, the glycidal ester monomer is glycidal acrylate or glycidyl methacrylate. In a preferred embodiment, the glycidyl ester impact modifier comprises first repeating units derived one or more glycidyl ester monomers and second repeating units derived from one or more α-olefin monomers, e.g., ethylene, propylene, 1-butene, 1-pentene. Suitable glycidyl ester copolymers may, optionally, contain a minor amount, i.e., up to about 50 wt%, of repeating units derived from one or more other monoethylenically unsaturated monomers that are copolymerizable with the glycidyl ester monomer. As used herein the terminology "monoethylenically unsaturated" means having a single site of ethylenic unsaturation per molecule. Suitable copolymerizable monoethylenically unsaturated monomers include, e.g., vinyl aromatic monomers such as, e.g., styrene and vinyl toluene, vinyl esters such as e.g., vinyl acetate and vinyl propionate, and (C1-C20)alkyl (meth)acrylates such as, e.g., butyl acrylate, methyl methacrylate, cyclohexyl methacrylate. As used herein, the term "(C1-C20)alkyl " means a straight or branched alkyl group of from 1 to 20 carbon atoms per group, such as e.g., methyl, ethyl, decyl, eicosyl, cyclohexyl and the term "(meth)acrylate" refers collectively to acrylate compounds and methacrylate compounds. Suitable glycidyl ester copolymers can be made by, e.g., conventional free radical initiated copolymerization or graft polymerization methods. d is from 0 to 50. In a more highly, preferred embodiment, R1 is H, (C1-C20)alkyl, (C5-C20)cycloalkyl or (C6-C20)aryl. As used herein, the term "(C5-C20)cycloalkyl" means a cyclic alkyl group of from 5 to 20 carbon atoms per group such as e.g., cyclohexyl, cyclooctyl, and the term "(C6-C20)aryl" means a hydrocarbon group that includes one or more unsaturated six-membered carbon rings, and may, optionally, be substituted with one or more alkyl groups on one of the aromatic rings, to form a substituent group having a total of from 6 to 20 carbon atoms per group, such as, e.g., phenyl, naphthyl, tolyl, xylyl, mesityl, isopropyl phenyl. In a more highly preferred embodiment, R2, R3 and R5 are each independently H or methyl. In a more highly preferred embodiment, R4 and R6 are each independently (C1-C20)alkyl. In a more highly preferred embodiment, R1 is H, R2 and R3 are each independently H or methyl, each R4 is independently (C1-C4)alkyl, a is from 45 to 75, b is from 5 to 15, c is from 20 to 40 and d is 0. In a preferred embodiment, the melt index , as measured at 190°C according to ASTM D-1238, of the glycidyl ester impact modifier is from 0.1 to 100 grams/10 minutes and preferably from 0.5 to 30 grams/10 minutes. In a preferred embodiment, the glycidyl ester impact modifier comprises one or more copolymers selected from olefin-glycidyl (meth)acrylate copolymers, olefin-vinyl acetate-glycidyl (meth)acrylate copolymers and olefin-glycidyl (meth)acrylate-alkyl (meth)acrylate copolymers. The glycidyl ester impact modifier and polycarbonate resin are combined, preferably by melt blending, to form the glycidyl ester impact modifier/ polycarbonate resin blend. In a highly preferred embodiment, the glycidyl ester impact modifier and the polycarbonate resin are combined and subjected to mixing in the molten state, e.g., in an extruder or a continuous mixer, then shaped, e.g., by extrusion, then cooled and then reduced to particulate form, e.g., by pelletizing, to produce the glycidyl ester impact modifier/polycarbonate resin blend of the present invention. In a first highly preferred embodiment, solid particles of the glycidyl ester impact modifier and the polycarbonate resin are pre-mixed by combining the particles and mechanically mixing the combined particles, e.g., in a drum mixer, and the resultant particulate pre-mix is then melt blended. In an alternative highly preferred embodiment, metered amounts of solid particles of the glycidyl ester impact modifier and of the polycarbonate resin are simultaneously fed to a device for melt blending without a premixing step. In a preferred embodiment, the blend of the present invention comprises from 20 to 80 parts by weight ("pbw") more preferably from 25 to 55 pbw, of the polycarbonate resin; from 20 to 80 pbw, more preferably from 25 to 55 pbw, of the polyester resin; and from 5 to 30 pbw, more preferably from 10 to 20 pbw, of the organopolysiloxane-polycarbonate block copolymer; from 1 to 10 pbw, more preferably from 2 to 8 pbw, of the glycidyl ester impact modifier, each based on 100 pbw of the blend. In a preferred embodiment, the glycidyl ester impact modifier is, as discussed above, combined with a first portion of the polycarbonate resin to form the glycidyl ester impact modifier/polycarbonate resin blend and the glycidyl ester impact modifier/polycarbonate resin blend is subsequently combined with the polvester resin and a second portion of the polycarbonate resin to provide the impact modified thermoplastic resin composition of the present invention. To provide desired stiffness, the reinforcing material is desirably a glass fiber reinforcing agent, mineral filler, talc, clay, mica, silica, milled or flaked glass or carbon fibers. Preferably, glass fiber or filamentous glass is employed as a reinforcement in the present compositions. For compositions ultimately to be employed for electrical uses, it is preferred to use fibrous glass filaments comprised of borosilicate glass that is relatively soda-free. This is known as "E" glass. The filaments are made by standard processes, e.g., by steam or air blowing, flame blowing and mechanical pulling. The preferred filaments for plastic reinforcement are made by mechanical pulling. The filament diameters preferably range from about 3 to 30 microns. The length of the glass filaments and whether or not they are bundled into fibers and the fibers bundled in turn into yarns, ropes or rovings, or woven into mats are also not critical to the invention. However, in preparing the molding compositions it is convenient to use the filamentous glass in the form of chopped strands of from about 1/8 " to about 1/2" long. In articles molded from the compositions on the other hand, even shorter lengths will be encountered because, during compounding considerable fragmentation will occur. In other embodiments of the present invention, the compositions can further comprise impact modifiers. Particularly useful impact modifiers generally comprise rubbery impact modifiers. These are well known to those skilled in the art, and any of them normally employed with polyester resins may be employed herein. The preferred impact modifiers generally comprise an acrylic or methacrylic grafted polymer of a conjugated diene or an acrylate elastomer, alone, or copolymerized with a vinyl aromatic compound. Particularly useful are the core-shell polymers of the type available from Rohm & Haas, for example, those sold under the trade designation Acryloid®. In general these impact modifiers contain units derived from butadiene or isoprene, alone or in combination with a vinyl aromatic compound, or butyl acrylate, alone or in combination with a vinyl aromatic compound. Most preferably, the impact modifier will comprise a two stage polymer having either a butadiene or butyl acrylate based rubbery core and a second stage polymerized from methylmethacrylate alone, or in combination with styrene. Also present in the first stage are cross linking and/or graft linking monomers. Examples of the crosslinking monomers include 1,3-butylene diacrylate, divinyl benzene and butylene dimethacrylate. Examples of graftlinking monomers are allyl acrylate, allyl methacrylate and diallyl maleate. Additional preferred impact modifiers are of the type disclosed in U.S. Patent No. 4,292,233. These impact modifiers comprise, generally, a relatively high content of a butadiene polymer grafted base having grafted thereon acrylonitrile and styrene. Other suitable impact modifiers include, but are not limited to ethylene vinyl acetate, ethylene ethylacrylate copolymers, SEBS (styrene-ethylene-butylene styrene) and SBS (styrene-butadiene-styrene) block copolymers, EPDM (ethylene propylene diene monomer) and EPR (ethylene propylene rubber) copolymers, etc. All of these are well known to those skilled in the art and are available commercially. 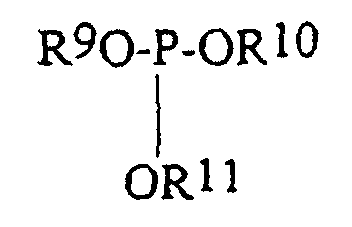 where R9, R10 and R11 are independently selected from the group consisting of hydrogen, alkyl and aryl with the proviso that at least one of R9, R10 and R11 is hydrogen or alkyl. The phosphate salts of a Group IB or Group IIB metal include zinc phosphate, copper phosphate and the like. The phosphorus oxo acids include phosphorous acid, phosphoric acid, polyphosphoric acid or hypophosphorous acid. The polyacid pyrophosphates of the formula: Mz x Hy Pn O3n+1 wherein M is a metal, x is a number ranging from 1 to 12 and y is a number ranging 1 to 12, n is a number from 2 to 10, z is a number from 1 to 5 and the sum of (xz)+y is equal to n+2. These compounds include Na3HP2O7; K2H2P2O7; KNaH2P2O7 and Na2H2P2O7. The particle size of the polyacid pyrophosphate should be less than 75 microns, preferably less than 50 microns and most preferably less than 10 microns. The amount of flame-retardant additive should be present in an amount at least sufficient to reduce the flammability of the polyester resin, preferably to a UL94 V-0 rating. The amount will vary with the nature of the resin and with the efficiency of the additive. In general, however, the amount of additive will be from 2 to 20 percent by weight based on the weight of resin. A preferred range will be from about 5 to 15 percent. Typically halogenated aromatic flame-retardants include tetrabromobisphenol A polycarbonate oligomer, polybromophenyl ether, brominated polystyrene, brominated BPA polyepoxide, brominated imides, brominated polycarbonate, poly (haloaryl acrylate), poly (haloaryl methacrylate), or mixtures thereof. Poly (haloaryl acrylate) is preferred with the most preferably being poly (pentabromobenzyl acrylate). PBB-PA has been known for some time, and is a valuable flame-retardant material, useful in a number of synthetic resins. PBB-PA is prepared by the polymerization of pentabromobenzyl acrylate ester (PBB-MA). The PBB-PA polymeric flame-retardant material is incorporated into the synthetic resin during processing to impart flame retardant characteristics. Examples of other suitable flame retardants are brominated polystyrenes such as polydibromostyrene and polytribromostyrene, decabromobiphenyl ethane, tetrabromobiphenyl, brominated alpha, omega - alkylene-bis-phthalimides, e.g. N,N'-ethylene-bis-tetrabromophthalimide, oligomeric brominated carbonates, especially carbonates derived from tetrabromobisphenol A, which, if desired, are end-capped with phenoxy radicals, or with brominated phenoxy radicals, or brominated epoxy resins. Other aromatic carbonate flame retardants are set forth in U.S. Patent 4,636,544 to Hepp. The flame retardants are typically used with a synergist, particularily inorganic antimony compounds. Such compounds are widely available or can be made in known ways. Typical, inorganic synergist compounds include Sb2O5; SbS3; and the like. Especially preferred is antimony trioxide (Sb2O3). Synergists such as antimony oxides, are typically used at about 0.5 to 15, and more preferably from 1 to 6 percent by weight based on the weight percent of resin in the final composition. Also, the final composition may contain polytetrafluoroethylene (PTFE) type resins or copolymers used to reduce dripping in flame retardant thermoplastics. Preferably other ingredients are employed in low amounts, typically less than 5 percent by weight of the total composition, and include stabilizers, mold release, lubricants, colorants, nucleants, antioxidants and UV absorbers. Articles which are molded from the formulated resins, especially injection molded enclosures, are suitable for use in electrical communication devices such as cable connections, telephone, computer, video, etc. and network interface devices for residential, commercial and industrial. The following examples illustrate the preparation of certain compositions within the scope of this invention. All parts, except as otherwise indicated, are by weight. The experimental blends were melt compounded in a 30 mm twin screw extruder at 300 rpm and stock temperature of approximately 250° C. to 265° C. Injection molding of test specimens was completed at 260°C (500° F) melt temperature and mold temperature was 66°C (150° F). V-0: the average period of flaming and /or smoldering after removing the igniting flame should not exceed five seconds and none of the samples should produce drips of particles which ignite absorbent cotton. V-1: the average period of flaming and/or smoldering after removing the igniting flame should not exceed twenty-five seconds and none of the samples should produce drips of particles which ignite absorbent cotton. V-2: the average period of flaming and/or smoldering after removing the igniting flame should not exceed twenty-five seconds and the samples may produce drips of burning particles which ignite absorbent cotton. Mechanical properties were measured using ASTM tests D256 (Izod), D638 (Tensile strength and elongation), D790 (Flexural strength and modulus, D3763 (biaxial or instrumented impact, also with ribbed sample), and G26 (weathering). The siloxane-copolycarbonate coupled with glycidyl ester impact modifier for enhancing weatherablity, Examples 1-5, showed impact ductility retention at -20 degrees Centigrade after 4320 hours Xenon arc exposure. In contrast, blends of the Comparative Example A with MBS modifier lose -20 degree Centigrade ductility after 360 hours of exposure. The PBT/PC/Siloxane-PC ternary blend compositions shows good impact srrength retention after Xenon arc accelerated weathering according to ASTM G26. See Impact energy (ft-lb) Nm-20°C (G26/4320hr UV) of (6.1), 8.3 (7.0), 9.5 (7.8), 10.6 (6.9) 9.4 and (7.3) 9.9 for Examples 1 to 5 of the present invention as compared to (1.4) 1.9 for Comparative Example A. For the Examples of the invention UL 94 was passed. Enhanced weatherablity was achieved without sacrificing favorable mechanical, processibity, shrinkage, heat distortion, properties. Impact energy was measured using biaxial impact on a single weatered chip. See Melt Viscosity MV@250°C 10-1 Pa.s (poise), D3763 (biaxial or instrumented impact ) DYN@-20°C, Notched Impact Strength (NI), Flexual Modulus, Flexual Strength, Tensile Break, Tensile Yield, and Tensile Elongation as set forth. The impact rib test was carried out on a 10.16 cm (4 inch) disk with a rib in the center below the point of impact. This is more demanding than the standard impact test. Additional, properties of the M, To achieve chemical resistance to the eight Bellcore chemicals, i.e. CRC 226 Water, WD-40 Walter, Rainbow 4353 Wasp & Ant Spray, 3% Sulfuric Acid, 0.2 N Sodium Hydroxide, Kerosene. Examples 1-5 show good chemical resistance to Bellcore chemicals. Phosphite 168 Irgafos 168 Tris(2,4-di-t-butylphenyl)phosphite, Ciba Geigy Co.
A modified flame retarded resin molding composition with enhanced weatherable properties comprising a polyester and polycarbonate blend with an organopolysiloxane-polycarbonate copolymer and a glycidyl ester impact modifier polymer comprising repeating monomer units derived from one a more glycidyl esters of an ethylenically unsaturated carboxylic acid for enhancing weatherablity and a flame retarding amount of a halogenated flame retardant. wherein R' is a member selected from the class of monovalent hydrocarbon radicals, halogenated monovalent hydrocarbon radicals and cyanoalkyl radicals; E is independently selected from the group consisting of hydrogen, lower alkyl, alkoxy radicals, aryl, and alkylaryl, halogen radicals and mixtures thereof, and R" is a divalent hydrocarbon radical, and n is from about 10 to about 120.
and D is a divalent hydrocarbon radical containing from 1-15 carbon atoms; -S-, -SO-, -S(O)2; or -O-. wherein R', R", E and n are as defined in claim 2. A flame retarded resin molding composition according to claim 4. wherein E is independently selected from the group consisting of hydrogen, alkyl of 1 to 6 carbon atoms, and halogen. A flame retarded resin molding composition according to claim 1 wherein said glycidyl ester impact modifier comprises first repeating units derived one or more glycidyl ester monomers and second repeating units derived from one or more α-olefin monomers. A flame retarded resin molding composition according to claim 1 wherein said glycidyl ester impact modifier comprises from 0.5 to 10 wt% of the total composition. wherein: R1 is H, alkyl-or aryl; R2, R3 and R5 are each independently H or (C1-C6) alkyl; R4 and R6 are each independently alkyl or aryl; a + b + c + d =100; a is from 50 to 99.5; b is from 0.5 to 25; c is from 0 to 50; and d is from 0 to 50. A flame retarded resin molding composition according to claim 1 wherein said flame retardant is a halogenated epoxy, poly (haloarylmethacrylate), halogenated polystyrene or a poly (haloarylacrylate) flame retardant. A flame retarded resin molding composition according to claim 1 wherein said flame retardant is a polybromobenzylacrylate flame retardant . Owner name: SABIC INNOVATIVE PLASTICS IP B.V.